Tucked away inside a customs building in Otay Mesa is a macabre collection of wild animals, many endangered, turned into trinkets, powders and clothing. “There's an elephant's foot stool there with the actual toenails still on it. It might be made into a stool, a wastepaper basket. An umbrella stand,” supervisory wildlife inspector Mike Osborn said. In his 30 years with the U.S. Fish and Wildlife Service, Osborn has seen it all. Osborn showed us a permanent collection they keep at the site. There are rugs made from tigers, jaguars and even a polar bear. Then there are the more common items they seize, such as bags of smuggled sea horses and sea cucumbers used in Chinese medicine. “Obviously, here on the border, a lot from Mexico,” Osborn said. Osborn holds up a package of vials with Chinese writing and a picture of a bear. “Gall, that's milked from the gall bladders of the bears in China. It's crystallized, made into a crystal and this is dissolved in your tea or your soup,” Osborn said. Osborn holds up packages of ground tiger. It would be sold on the black market, he said. “Here in southern California, or in San Diego, one of these might go for maybe 50-bucks or 100-bucks,” Osborn said. There are items that may look legal, like cowboy boots. The problem is, they are made from an endangered crocodile. 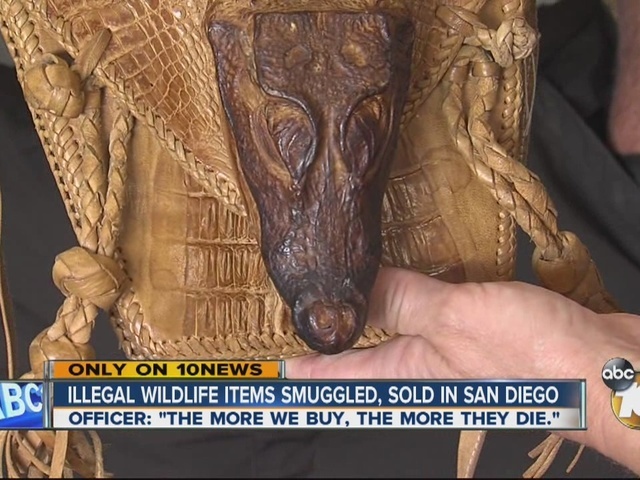 Osborn said besides the border, they find illegal wildlife items coming in at the San Diego airport and for sale in the city. “So, we might find this stuff at swap meets,” Osborn said. Some knowingly smuggle this stuff in. Sometimes people unknowingly buy illegal animal trinkets on vacation, he said. The only way to stop it is to stop the demand. “Basically, what it amounts to is the more we buy the more will die,” Osborn said.